I have been so flattered by the number of requests I’ve received for a write up on this year’s Minnesota State Fair! The fact you are all reading my blog enough to remember I did a State Fair post last year is amazing, and now you want more. Wow! Thank you! So here’s some of my new favorites at the State Fair, and a few tips on how to discover favorites of your own! The guy who served these to me thanked me for not making a joke about their name. While it is a funny name, these deep-fried mashed sweet potatoes are no laughing matter. Drizzled with chocolate sauce and served with a side of whipped cream, these sweet potatoes are like nothing you’ve tasted before. Even if you hate sweet potatoes, I’d encourage you to give these a try, they taste more like cinnamon than sweet potato and have a buttery texture that works beautifully with the crispy outside. A word of warning: These things come out HOT, so let them cool a bit before biting into one. You really can’t do the Minnesota State Fair in one day. You can try, but how could you ever take in all the awesomeness there is to be had when you’re too full of cheese curds to walk over to the animal barns and commiserate with the state’s largest pig? The trick, my friends, is to space out all the joy over multiple days. For anyone not living in Minnesota, or even you Minnesotans who have yet to experience the fair, this might sound insane. Why would you want to spend a day on your feet, fighting the crowds, dodging animal doo-doo, and walk away (hopefully!) five pounds heavier? Because the Minnesota State Fair is THAT much of a spectacle. For Minnesotans, our state fair is a Big Deal. And yes, you walk a lot, but really that only keeps you from gaining ten pounds instead of five. Yes, it’s usually crowded, but those crowd members are sporting mullets, tattoos, belt buckles and fishnet stockings (only sometimes on the legs) with glorious abandon. You will have to dodge the poo, but you can’t really blame the animals for that, and every person at the fair has their own unique dodge-the-droppings dance. And finally there is the food. Yes, you will be heavier at the end of the day, but it is worth it for the amazing variety and tastes happening at the fair. 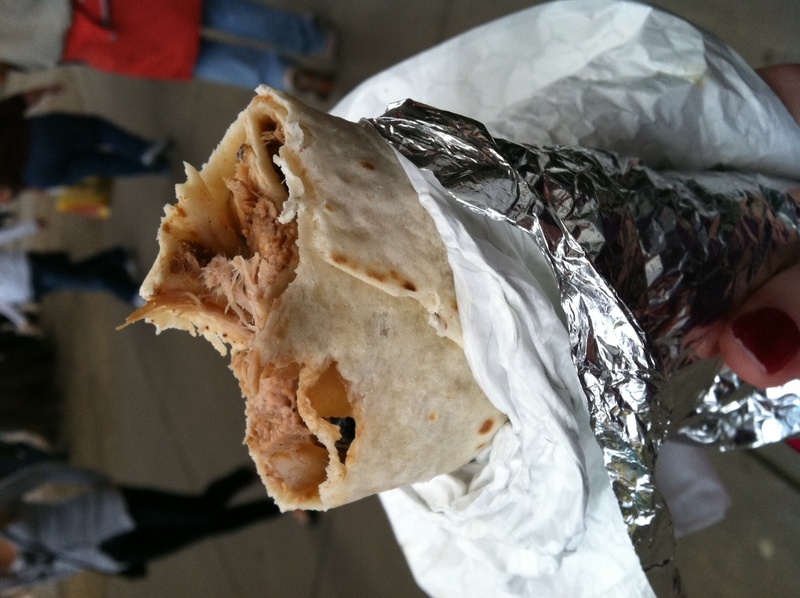 So, without further ado, here is my list of top Minnesota State Fair must haves! Do not get your cheese curds anywhere else. We’ve tried them, they are not this good. 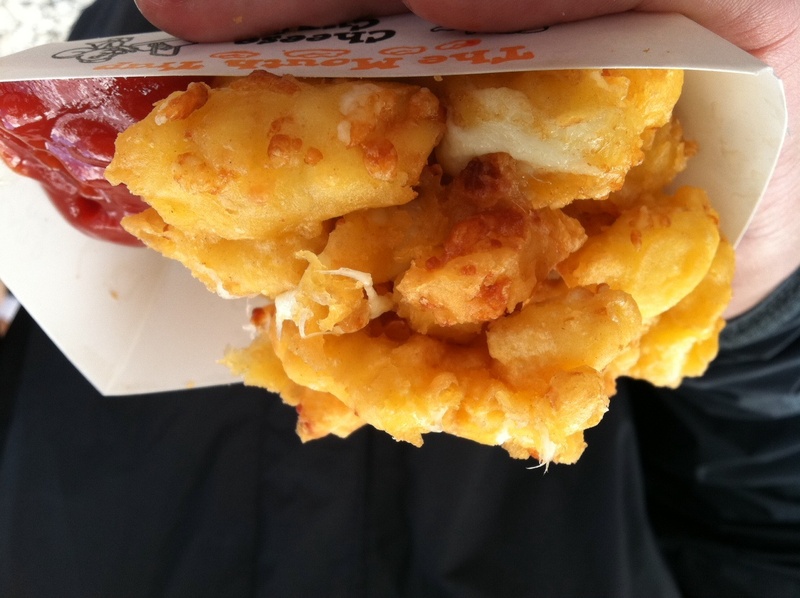 These cheese curds are so fresh you can almost get a squeak out of them as you take a bite. The batter is crispy and thin, really all that’s necessary to carry the gooey cheese from the paper curd boat to your mouth. They’re always piping hot due to their popularity; you get them right out of the frier because they’re handing them out as fast as they can make them. I don’t know their secret, but somehow they make these little bundles of hot melty joy better and better each year. These are by far the most delicious onion rings I have ever had. Ever! 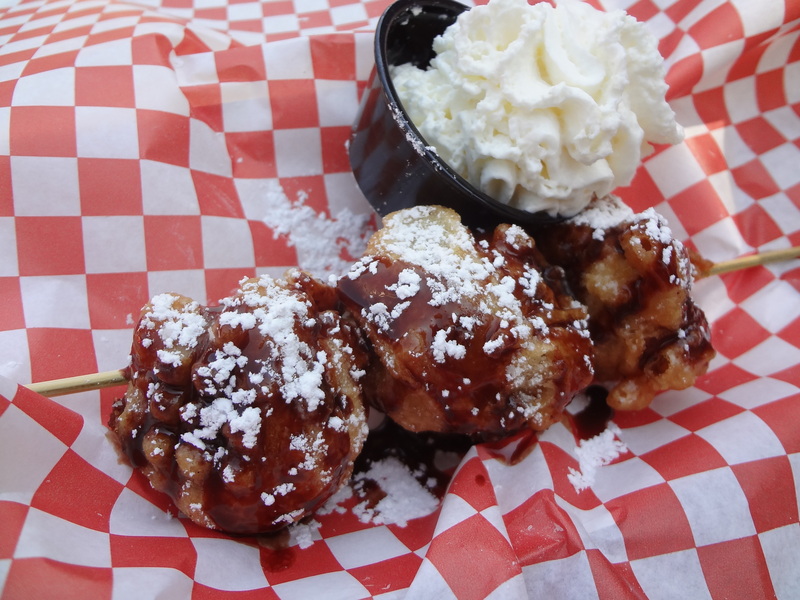 My boyfriend came back with these on a previous trip to the fair and when I demanded to know where these little bites of heaven came from I was shocked when he pointed to a tiny, very nondescript, little stand outside the food building. 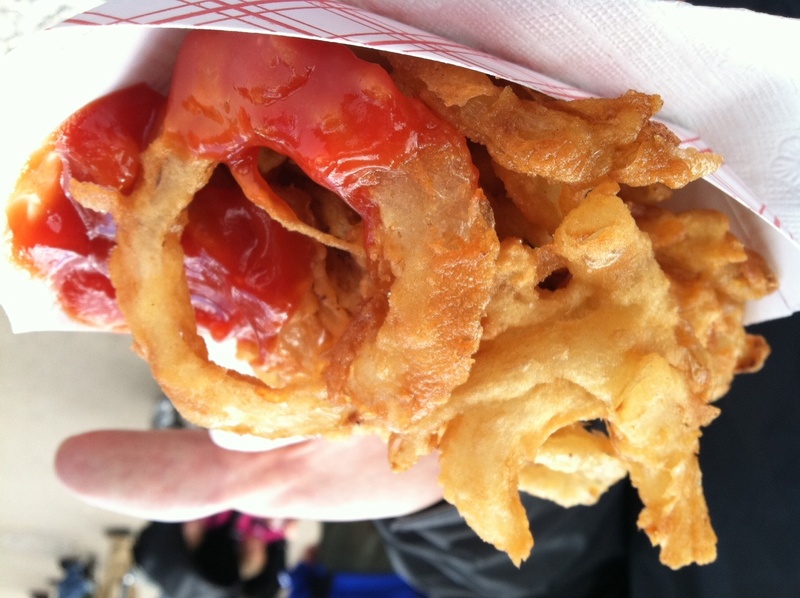 It could have been any stand at any local fair or festival, but these onion rings have forever made this stand a stop on my state fair route. As you can see from the picture, these onion rings aren’t your typical breaded and fried rings. You don’t run into the problem of taking a bite out of one of these and having the whole onion slice slip out of it’s coating leaving you with a fried (but still tasty) semicircle. The batter on these rings is sweet which is a nice change to counter the bite of the onion. 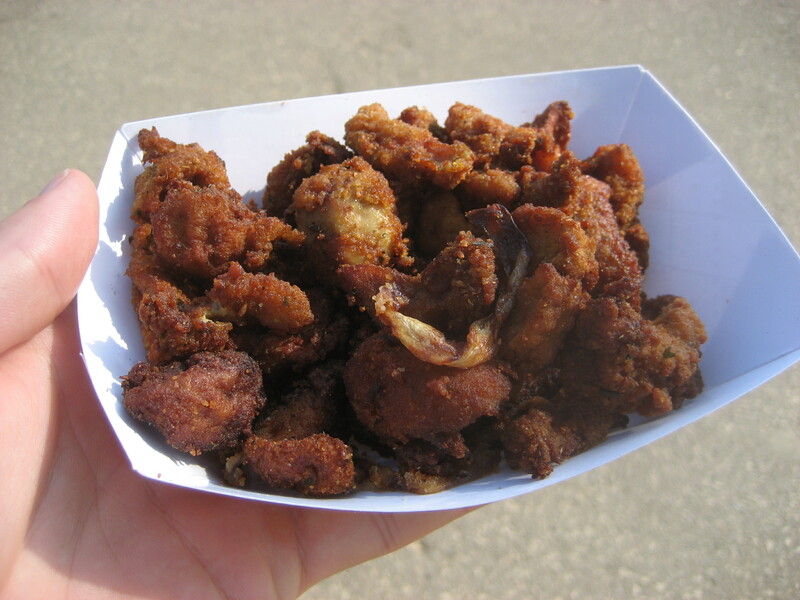 They’re wonderfully light, crispy, and can satisfy a craving for fried foods without the feeling that you’ll need to be rolled out of the fair like a barrel. Most people pass right by this tiny stand under the bridge leading to the Grandstand. I like to think of it as the fair’s best kept secret, and I am probably doing myself no favor by writing about it here since I love that I can usually walk right up and no line 40 people deep is standing between me and this amazing, thick, creamy, unbelievably satisfying frozen custard. There really aren’t many places in Minnesota where you can find frozen custard. Obviously Culvers corners the market on this ice cream alternative, but this stuff blows Culvers out of the water. The first bite I took of this custard had me wide-eyed with amazement followed by quick demands that everyone in my skeptical party try it immediately. This is the thickest, most decadent frozen custard I have ever found. 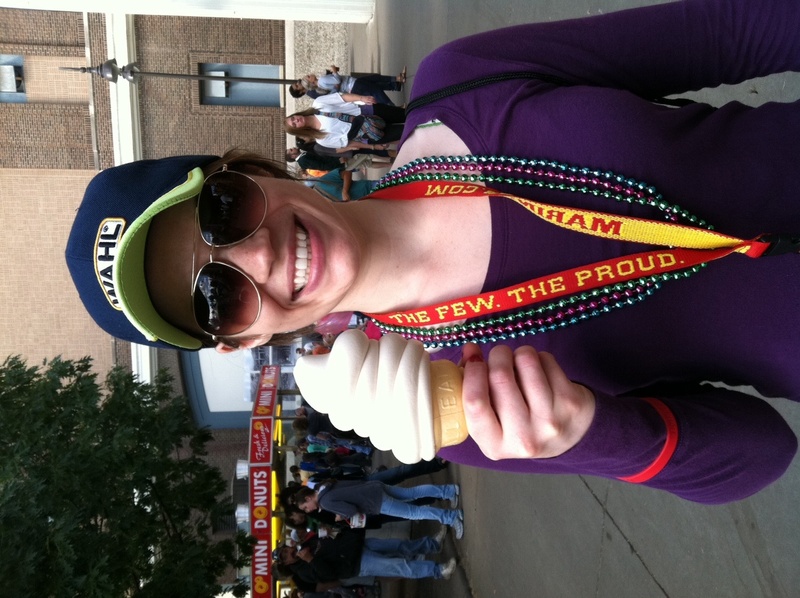 That said it’s not overly rich, and I managed to eat that entire cone sans tummy ache while still looking fly in my state fair swag. 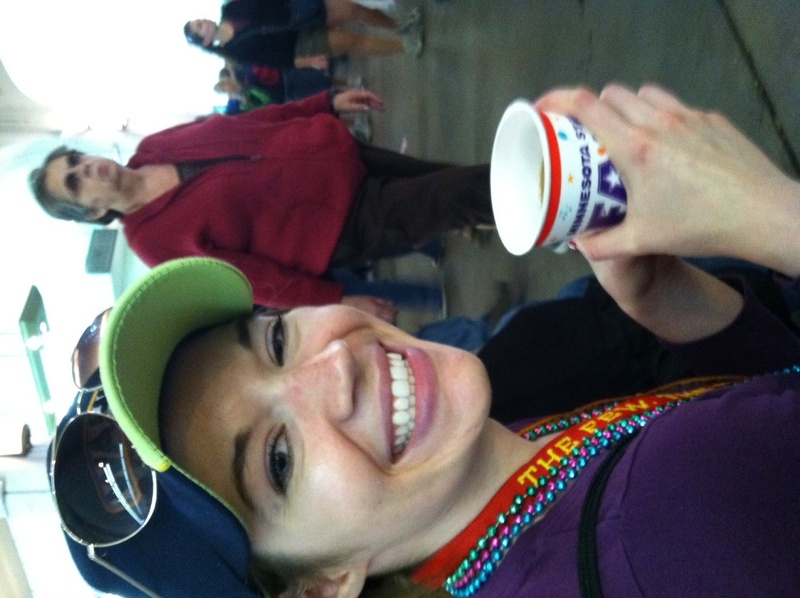 While this is neither the best picture of me, or the cider, the fabulous fair-goer in the background really goes with the general feel of the fair. The fair is a strange mix of urban and rural. We urbanites go there to stuff ourselves and oogle animals that the more rural crowd has brought there as a part of their livelihood. They’re competing to be the best in the state with their livestock, baked goods, vegetables, you name it! This apple cider is a great example of the hybrids that come from such an environment. When I think of apple drinks in general I picture saturday morning cartoons, me in my jammies, cereal bowl in hand and a big glass of apple juice. This cider is reminiscent of those mornings, but in a farm fresh, just picked, best of the crop sort of way. You can tell this cider is made with whatever apples were just picked because it tastes different every time. The cider featured here was undoubtedly made from granny smiths and was a bit tarter than my previous visit to the stand. This is a great way to sneak in your fruits at the fair and a full glass is only $1! Cookies! The reason these chocolate chip cookies are on my must have list isn’t because they’re the best chocolate chip cookies I’ve ever had. They’re good, don’t get me wrong, really good in fact, but it’s more that they come hot out of the oven and into my hand that makes these a necessity. 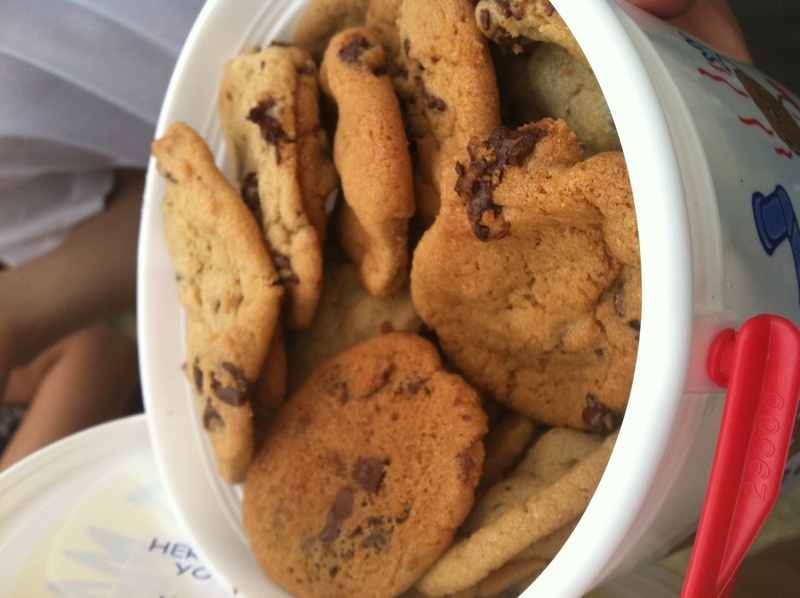 Yes, chocolate chip cookies are an odd thing to get at the fair, but can you ever really pass up freshly baked cookies? I think not. Is an entire bucket necessary? Depends on who you ask. It’s great for large groups of course, but my favorite way to eat a bucket is shared with someone I love while we watch the annual talent show, but there is something to be said for the family of four who each sported their own bucket. And what do you need to wash down all those melted chocolate chips? You guessed it! Because nothing goes better with chocolate chip dimples than a milk moustache. All you can drink milk for a dollar. Cold, frothy, and unbelievably refreshing on a hot day. Enough said. A new entry to the list of must haves! I didn’t think it was possible to expand this list further (only because I didn’t think I could eat anything more) but I somehow managed to make room for this fajita. Let me just say, I never imagined myself eating, or even wanting to eat Mexican food at the state fair. I don’t know why, maybe it just wasn’t fried enough for me, but for whatever reason I was prejudice. I had walked by Juanita’s Fajitas often enough before, it’s also located just under the bridge to the grandstand (a possible deliciousness connection???) and looked like your average fajita vendor at these sorts of events. Well I was wrong. SO wrong. The stars aligned that fateful Sunday at the fair, it was too early for the cookies, but I was looking for something substantial after not eating anything but apple cider for the past 3 or so hours and I suddenly had a craving for Mexican. Luckily I was close by to Juanita’s or the whole thing could have ended much differently. I randomly selected the carnita fajita (because it’s fun to say) and it was love at first bite. I didn’t even see it coming. The meat is a tender juicy pork mixed with three types of beans, black, pinto and chick peas (do those count as beans? ), as well as your standard pepper and onion mix with pico de gallo thrown in for a colorful masterpiece. This fajita was wrapped more like a burrito and thank goodness it was because that sucker was juicy! I’m talking dripping down your fingers juicy, so I suppose it was a win-win that it was also finger licking good! 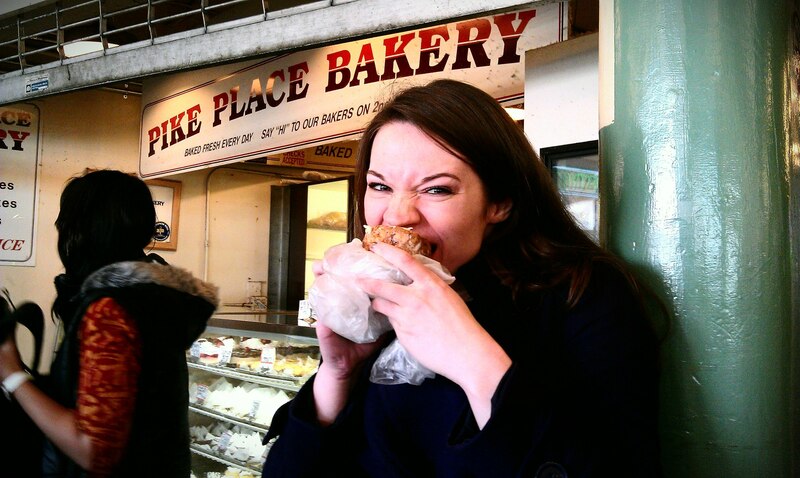 What do alligators, cookie dough and Michelle Bachman banana splits have in common? 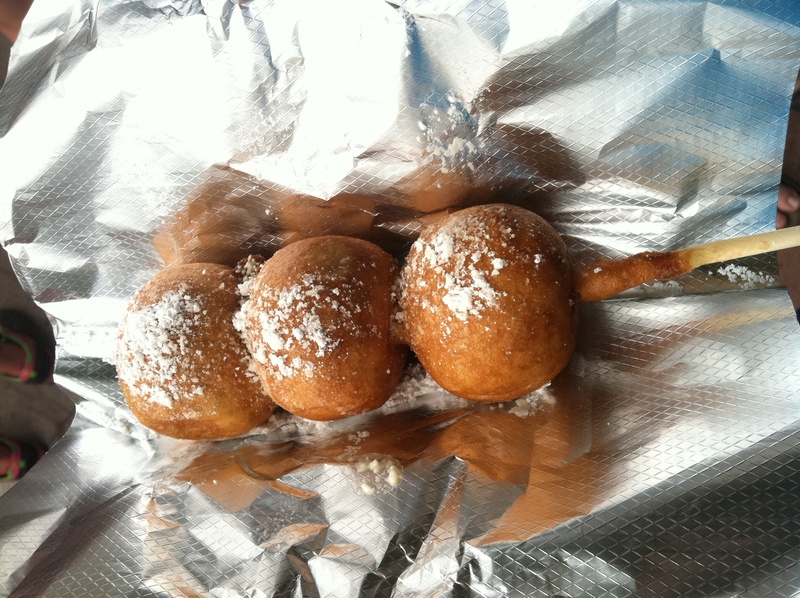 They all come deep fried at the Minnesota State Fair! The Capers & Co. was at the fair on Saturday sampling some of the many (many!) 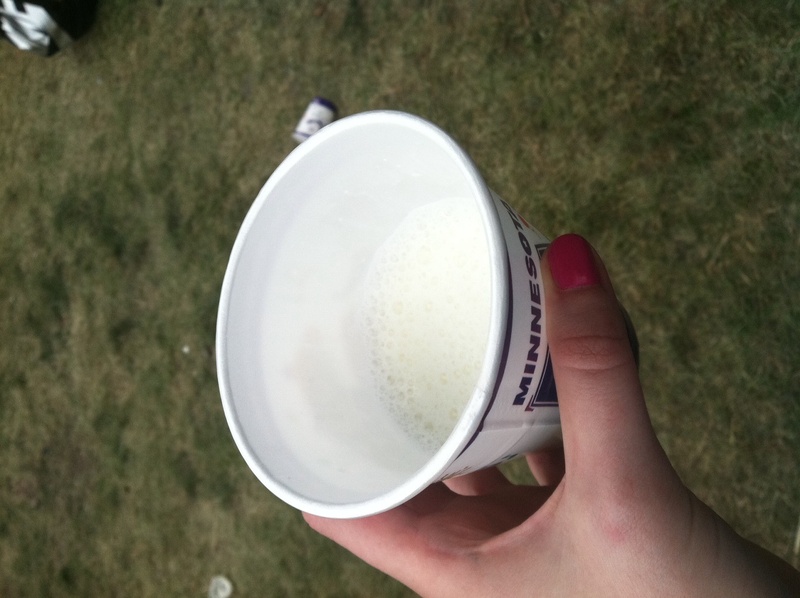 culinary delicacies offered at the Great Minnesota Get Together. Here’s what to try and what to skip when you take your trip to the mecca of questionable fashion chocies.